Hospitality and comfort are one of the most important features when selecting accommodation, but one commonly overlooked feature is the security processes that are followed by these establishments.With the growth of the short-stay market, guests are realizing that the security are critical factors. Safety and security are hot button topics especially in developing countries, and with the advent of the alternative stay industry the security aspect must also be given importance. There are several establishments that offer “heavy discounts” and cheap rooms. But guests need to be sure about the security protocols followed by these establishments. This is especially relevant for single and women travellers. Delhi NCR is a huge heterogeneous region and safety is a prime concern for travellers. It is easy to get duped by fly by nights operators who are running their establishments without due regard to basic procedures. No reviews on Tripadvisor and other websites. No management contacts provided at time of booking. Airbnb provides you with direct owner contacts. The location of a property is also a very important safety feature. Guest houses and Service Apartments are normally located in residential areas and central business districts, these areas normally have a lot of security. 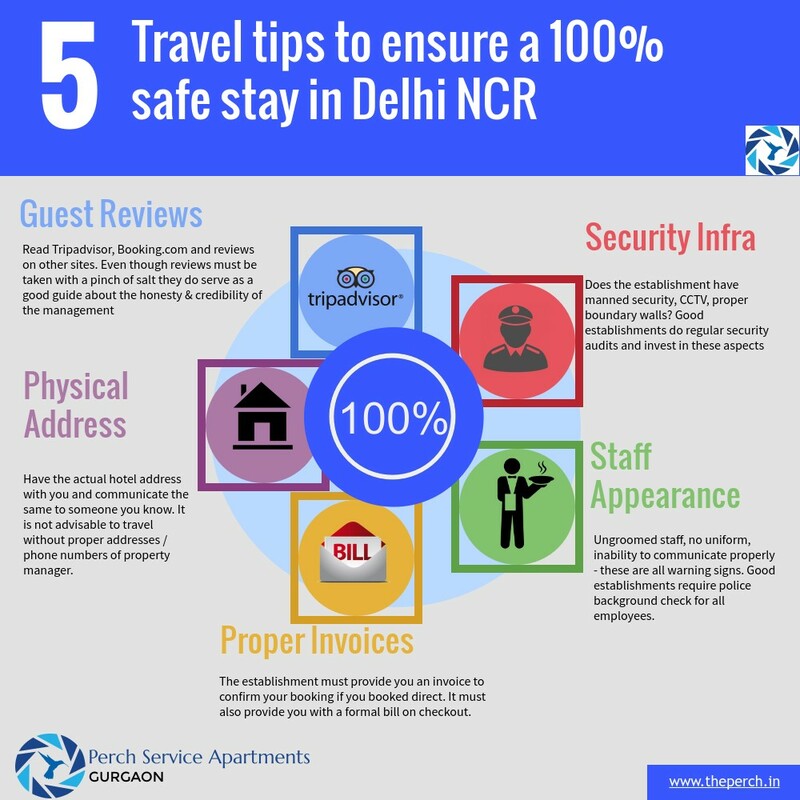 Even then, before selecting a service apartment in Gurgaon for rent, do look into all the above factors – your safety is important. Also check that the staff and management are professional in their conduct. One of the most important factors is how comfortable you feel after communicating with the management – a phone conversation is always a good thing before booking an accommodation in Gurgaon. If the management is transparent & honest, there is a high likelihood they would have given due weight to safety as well. If you follow the above precautions you will have a relaxed stay in Gurgaon!